Bones in our body are living tissue. They have their own blood vessels and are made of living cells, which help them to grow and to repair themselves. As well, proteins, minerals and vitamins make up the bone. We are born with about 300 soft bones. During childhood and adolescence, the cartilage grows and is slowly replaced by hard bone. Some of these bones later fuse together, so that the adult skeleton has 206 bones. Bone age is the degree of maturation of a child's bones. As a person grows from fetal life through childhood, puberty, and finishes growth as a young adult, the bones of the skeleton change in size and shape. These changes can be seen by x-ray. The "bone age" of a child is the average age at which children reach this stage of bone maturation. A child's current height and bone age can be used to predict adult height. Bone age x-rays helps to evaluate children for advanced or delayed growth and physical development. The most commonly used method is based on a single x-ray of the left hand, fingers, and wrist. A hand is easily x-rayed with minimal radiation and shows many bones in a single view. The bones in the x-ray are compared to the bones of a standard atlas, usually "Greulich and Pyle". Bones are rigid organs that constitute part of the endoskeleton of vertebrates. The determination of bone age in the clinic is necessary to diagnose early development disorders of children, as well as in legal cases to determine, if an adolescent has reached the age of majority. The two most common approaches for bone age estimation are the manual methods from Greulich & Pyle (GP) and from Tanner & Whitehouse (TW). In the first method a physician compares all hand bones in an x-ray image to reference images from an atlas to determine the correct age. In the latter method a subset of hand bones are classified independently and these results are then weighted and combined to determine the age. Since both methods are performed manually, they are time-consuming, user-dependent and require a substantial amount of expert knowledge.In one approach, automatic bone age classification from hand x-ray images is done using the Discriminative Generalized Hough Transform (DGHT). For this purpose, two models are used. The localization model is able to localize the target region over a broad age range and therefore focuses on the common features of all ages. The model for the classification, in contrast, focuses on the age discriminating features. In this work, the feature extracted are CROI (Carpal ROI), EMROI (Ephiphysial/Metaphysial ROI), using discrete wavelet transformation, ISEF edge detector, energy based segmentation, Jacobi method, cell full and vertex full method. Extracted features are classified using k-mean classifier, after which the bone age can be estimated. Greulich and Pyle method is commonly used method which is based on a single x-ray of the left hand, fingers, and wrist. A hand is easily x-rayed with minimal radiation and shows many bones in a single view. The bones in the x-ray are compared to the bones of a standard atlas, usually "Greulich and Pyle". The Greulich and Pyle method as originally described involves a complex comparison of all of the bones in the hand and wrist against reference “normal” radiographs of different ages. A more complex method also based on hand x-rays is the "TW2" method. An atlas based on knee maturation has also been compiled. The TW2 method relies on the systematic evaluation of the maturity of all the bones in the hand and wrist. The hands of infants do not change much in the first year of life and if precise bone age assessment is desired, an x-ray of approximately half of the skeleton may be obtained to assess some of the areas such as shoulders and pelvis which change more in infancy. The goal of this project is to provide a system for hand bone age estimation. By analyzing left hand X-ray image and using region of extraction, bone age can be estimated.The proposed system helps to decrease the time factor in examining and processing the images.A new technique called Energy Based Segmentation is adopted in the work which increases the efficiency and accuracy. Determination of the age of the individual comes in routine forensic practice, as the age of the victim is one of the three primary characteristics of identification. The project can be helpful for the establishment of corpus delicti. The corpus delicti means the facts of any criminal offense. The project's implementation can also add benefits to areas such as sports medicine, where it is necessary to evaluate the athlete from an early age the degree of bone maturation respect to their chronological age, which would greatly promote their performance and athletic success. The input for image pre-processing is the standard set of images. The pre-processing is done to remove noise and eliminate irrelevant, visually unnecessary information and to crop the image. The feature extraction phase starts with testing input image. Image transformation is a function in which Discrete Wavelet Transformation is used. A discrete wavelet transform (DWT) is any wavelet transform for which the wavelets are discretely sampled. The discrete wavelet transform is a linear transformation that operates on a data vector whose length is an integer power of two, transforming it into a numerically different vector of the same length. For image analysis proposed system investigate more closely a specific area within the image, called region of interest (ROI). The operation that modifies the spatial coordinates of the image, and these are categorized as image geometry operations. The image geometry operations include Crop, Zoom, enlarge, shrink, translate and rotate. The region of interest for bone age estimation is phalangeal features, (EMROI) and carpal bones features (CROI). The Energy based segmentation introduces the energy-based segmentation approach wherein the energy of reconstructed surface(s) is directly used to segment the data. The goal of segmentation is to simplify and/or change the representation of an image into something that is more meaningful and easier to analyze. Image segmentation is typically used to locate objects and boundaries (lines, curves, etc.) in images. The result of image segmentation is a set of segments that collectively cover the entire image, or a set of contours extracted from the image. Jacobi method is an algorithm used for determining the solutions of a system of linear equations with largest absolute values in each row and column dominated by the diagonal element. The input images are compared with standard images and bone age is obtained via result phase. And the process is repeated for different set of images. Bones are rigid organs that constitute part of the endoskeleton of vertebrates. They support and protect the various organs of the body, produce red and white blood cells and store minerals. Bone tissue is a type of dense connective tissue. Bones come in a variety of shapes and have a complex internal and external structure, are lightweight yet strong and hard, and serve multiple functions. One of the types of tissue that makes up bone is the mineralized osseous tissue, also The carpus is the sole cluster of bones in the wrist between the radius and ulna and the metacarpus. The bones of the carpus do not belong to individual fingers (or toes in quadrupeds), whereas those of the metacarpus do. Carpal bone, any of several small angular bones that in humans make up called bone tissue, that gives it rigidity and a coral-like three-dimensional internal structure. 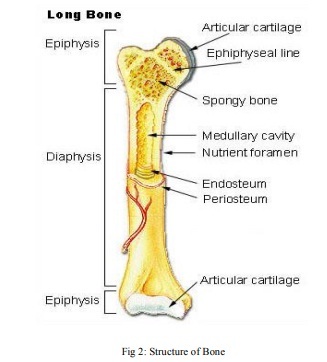 The structure of long bone is a shown in fig 2.The epiphysis is the rounded end of a long bone, at its joint with adjacent bone(s). Between the epiphysis and diaphysis lies the metaphysis, including the epiphyseal plate. At the joint, the epiphysis is covered with articular cartilage; below that covering is a zone similar to the epiphyseal plate, known as subchondral bone. The diaphysis is the main or midsection of a long bone. It is made up of cortical bone and usually contains bone marrow and adipose tissue the wrist (carpus), and in horses, cows, and other quadrupeds the “knee” of the foreleg. They correspond to the tarsal bones of the rear or lower limb. Their number varies. Primitive vertebrates typically had 12. In modern amphibians, reptiles, and birds, the number is reduced by fusion. In humans there are eight, arranged in two rows. The bones in the row toward the forearm are the scaphoid, lunate, triangular, and pisiform. The proposed work can be extended using ultrasound, MRI, IR images and low-dose CT technology, sand development of multi-factorial methods, involving hardware devices for easier bone age estimation. Skeletal maturity can be assessed in a number of ways. A big discrepancy between the calendar age and the bone age can indicate an atypical skeletal development. In many cases the decision whether to treat a child with growth hormones depends on the outcome of bone age estimation. The proposed system used EMROI, CROI, and Jacobi method with morphological features in proposed system. CROI based assessment investigates the size and shape of the carpal bones. In the new born, the carpal bones are nothing more than well-defined dots, which grow bigger almost uniformly as the subject ages. This is the reason that, in contrast to the EMROI approach, the CROI approach is more accurate in assessing skeletal chronological maturity. Hence this proposed system gives higher performance with great accuracy. This bone age assessment system offers a reliable, simpler and more efficient alternative to current methods, for use by residents, fellows, radiologists, and pediatric orthopedic surgeons. D. Giordano, R. Leonardi, F. Maiorana, G. Scarciofalo, and C. Spampinato: “Epiphysis and Metaphysis Extraction and Classification by Adaptive Thresholding and DoG Filtering for Automated Skeletal Bone Age Analysis” Proceedings International Conference of the IEEE EMBS Cité Internationale, Lyon, France August 23-26, 2007. P. Thangam, K. Thanushkodi ,T. V. Mahendiran: “Comparative Study of Skeletal Bone Age Assessment Approaches using Partitioning Technique”International Journal of Computer Applications Volume 45– No.18, May 2012. N. Olarte L, A. Rubiano F, A. Mejía F: “Comparison of Valuation Techniques for Bone Age Assessment” World Academy of Science, Engineering and Technology 68 2012. P.Thangam, T.V.Mahendiran and K. Thanushkodi: “Skeletal Bone Age Assessment – Research Directions” Review Article Journal of Engineering Science and Technology Review 5 (1) (2012) 90 – 96.